“What doesn’t kill you makes you stronger”. That is a moto that we had learned to live over the past few years. We always knew that God would see us through all trials and tribulations, because He always had in the past. We also knew that He helps those who help themselves. In June of 2013, we helped ourselves. This was when the wonderful world of Legalshield was introduced to us. On February 29, 2012, my wife worked the last day at her job. She was a medical assistant, and the doctor who she worked for during the previous 12 years, suddenly retired due to medical reasons. All of a sudden, what was a two income household was now a one income household. I was still working at my job as a probation officer with the Department of Juvenile Justice, and we were struggling with both incomes. After working part-time jobs and continuing her education for over a year, Sherranda was invited to a Legalshield briefing while working as a freelance ad executive. It was an hour that would change our lives. Sherranda had already made up her mind never to work for anyone else, because she did not want her family’s fortunes placed in anyone else’s hands. And this was the vehicle to do that. After signing us up, she sat me down in front of the computer and had me watch the entire 45 minute presentation by Mr. Darnell Self. Even in the very beginning, she knew not to say too much, get out of the way, and let those who knew do the talking. I was instantly sold, and there has been no turning back since. We fast start qualified at our first PBR, went to basic and group training within our first two months, and qualfied for executive director in our fifth month. 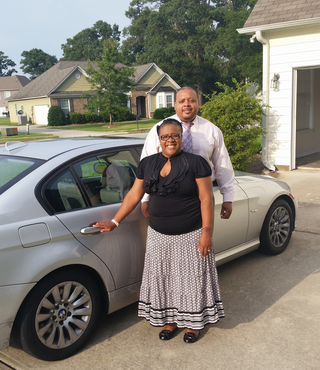 We have been performance club qualified since inception, and picked out our new BMW in our 12th month. All this has been accomplished by plugging in, going to all events, and following the system. Legalshield has afforded us the opportunity to spend more time with our 5 year old, and has allowed me to stay at my job, which I love. The difference now is that I don’t have the stigma of being there to just collect a check. More importantly, it has afforded Sherranda the opportunity to keep that promise she made to herself a year ago.